Curator's Office has announced the release of two new prints by Tom Green from his acclaimed Of This World body of work recently exhibited in April at Curator's Office. The two works were printed by the renowned master printer David Adamson of Adamson Editions. For further information on these two prints, please contact Curator's Office at 202.387.1008 or info@curatorsoffice.com. Of This World includes 8 of the last works on paper that the artist made in 2011, prior to being diagnosed with ALS (Lou Gehrig's disease). 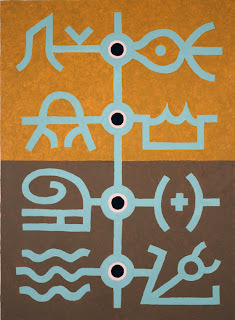 The suite is a lyrical compendium of the glyphic work the artist is so well-known for. 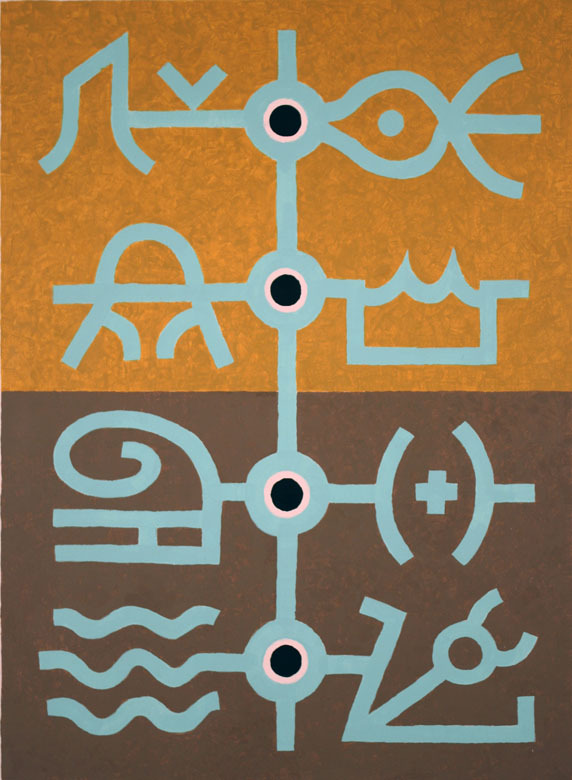 A horizon line unites the entire body of work, but his continued preoccupation with the semiotics of symbolic form is lucid, restrained, and powerful. 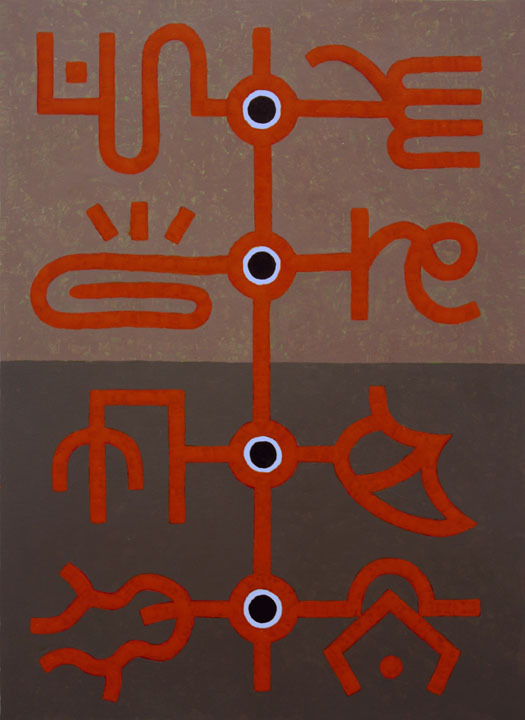 Tom Green began working with the glyph forms in the late sixties, while he was taking Pre-Columbian courses. He says, "Studying the Mayan culture, I was struck by the glyphic carvings and drawings that seemed so inventive yet puzzling. So I began writing notes in a glyphic script to my friends, not copying the Mayan forms but trying to create my own forms that would resonate in a contemporary mind. 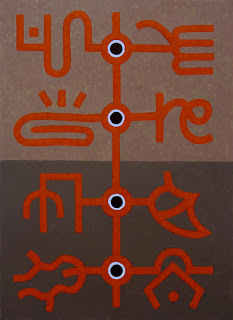 Around 1987, casting about for a new direction, I tried painting a canvas covered with glyphs. The glyphs are not a language. (I try not to repeat forms) but rather a series of discreet forms that are to be interpreted individually. Most are not abstract but derive from the sensory experiences of daily life." J.W.Mahoney writes, "The most obviously recognizable element in Tom Green's eight paper pieces is something that another master abstractionist, Mark Rothko, couldn't avoid: the horizon. Tom Green's facing a horizon we all will, that of leaving our circumstantial world for that beyond our personal life. Tom's working both sides of this line, so far, as his work reflects. But these pieces are still of this world, as Tom is." Deadline: Sunday, May 22, 2012, 12 midnight. An opportunity to hang as much artwork as possible in a space 10ft x 4ft for the month of August at Touchstone Gallery a contemporary gallery in the heart of Washington, DC. Digital images of all artwork required with application. There will be room for only 38 artists; each space about 10ft high x 4ft and 1 floor space for sculptor 5ft x 5ft. $240 hanging fee; work to be hung by their hanging committee. No entry fee is required. Must submit filled out application form that can be downloaded at www.touchstonegallery.com and e-mail it to images.touchstone@gmail.com along with images of the works you intend to show.